Social media banking. Earlier this month, Bank of America reached 100,000 twitter followers for media relations on @BofA_News, over 320,000 twitter followers in total. My Visible Banking Team now tracks 2,000+ twitter accounts (banking, insurance, investment, cards and payments) globally: 10m twitter followers from 88 countries (31st March 2013). 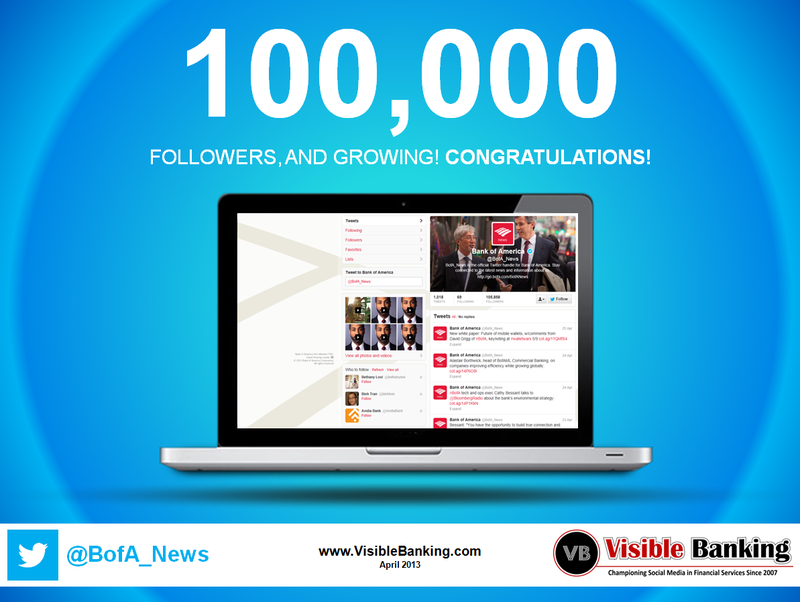 Congratulations to the Bank of America @BofA_News team for recently reaching 100,000 twitter followers! Please note that the activity on this account is limited, BofA tweeted only once a day on average in March 2013. We currently track 11 twitter accounts from Bank of America and Merrill Lynch focused on a broad range of areas like social customer care or careers, with a collective follower base of almost 320,000 twitter followers. Know Your Followers (KYF©): so you have a big twitter follower base? Good for you. Bear in mind that it is easy and cheap to buy tens of thousands of real looking twitter followers nowadays. Like with your facebook fans, you must aim to attract the right followers. The valuable ones: influencers, journalists, business partners, employees, prospects, customers. Size is important, but it is not everything. Tweet and engage with your audience on daily basis (SMO): having an account and pushing the occasional press release is not enough. Tweeting once a day a few tweets in a row with a poor syntax (hence virtually no reach) doesnt work. You must understand the popular social media channels like twitter or facebook, design and implement a smart twitter strategy based on quality content, engagement, response, and call to action. How do you think you compare with your peers in banking or insurance? Do you feel your current twitter presence doesnt generate enough activity? How much do you know about your communities on twitter and facebook? As usual, I invite you to share your comments, your questions and your best practices on social media in financial services here or on twitter. I just rolled through the last 600+ people who followed @BofA_News and couldn’t find but maybe 3-5 journalists. There were lots of foreigners, sports fans and teenage Justin Bieber fans… but not many reporters and financial industry analysts. I’d estimate that no more than 3% of those following @BofA_News have any genuine interest in what BofA has to say. According to Status People, 12% of the accounts following @BofA_News are fake, and another 42% are inactive. This is common among Verified accounts. Twitter actively promotes accounts that are verified, so those accounts end up with a lot of deadwood and lame followers.